Casa Victoria is located in the Coachella Valley of Southern California between the cities of Rancho Mirage and Palm Springs, surrounded by the San Jacinto Mountains. This three-story building of 49 apartments sits on three acres of lush landscaping, many trees, and a spectacular rose garden. The property was completed in 1999. 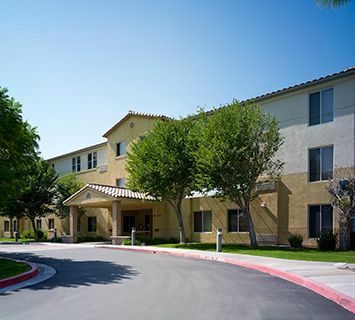 Casa Victoria is perfectly located in a quiet residential community that has many community amenities for our member’s convenience. Shops, post office, library, restaurants, movie theaters are all within a short walk. There is also pollution free public bus services to take our members to nearby gyms, full range of medical services and hospitals, colleges, as well as many community and cultural events and museums; we got it all! Casa Victoria Co-op is an established smoke-free community. It is not permitted to smoke in your apartment, nor in any common areas, nor outside the building within 25 feet from any entrance or apartment windows. Within our own community we enjoy being an active co-op with our many resident activities and volunteer opportunities. If you like being active and involved you will love the many socials and parties we share in on many occasions, not to exclude our Bingo and cards nights, a great mini store and monthly meetings.